Preparing meals, fostering creativity & education, hosting celebrations, providing comfort & hope throughout Austin. Helping children and youth develop the skills they need to put their best foot forward when they step out into the world. Women age 21 and older with an interest in voluntarism are welcome to visit us at The Caswell House the 1st Tuesday of the month. An Austin tradition since 1986, funding AJF's Grants Program providing financial support to charities & nonprofits. Providing Teddy Bears & Dalmatians to Austin's emergency services agencies to give to children in crisis. AJF was founded on March 28, 1969. That spring, 18 young women joined together to promote civic, educational, and philanthropic interests in Austin. 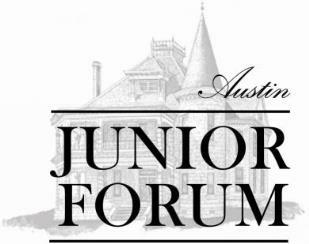 Application was made to Junior Forum, Inc., (JFI) to initiate a local chapter, and the following year, Austin Junior Forum was granted a charter and recognized as a chapter of JFI. AJF is one of nine JFI chapters in Texas, with Houston Junior Forum being the initial chapter founded in 1946. Each chapter is a private, non-profit service and welfare organization. In November 1978, AJF submitted a bid to the City of Austin for the purchase of the Daniel H. Caswell House. The city council awarded the home to AJF, but because the members were all women, they actually had to have their husbands sign the loan documents. To pay off the loan, AJF members compiled a cookbook titled Lone Star Legacy, which has sold over 200,000 copies since the initial printing in 1981 and will be available for purchase online soon. In the meantime, please call (512) 472-0779. Through sales of the cookbook, AJF members paid the note in full in three years. AJF members and their families spent many laborious hours working to rehabilitate the interior of this stately home. Now, the Caswell House serves as AJF's headquarters and center for community service, and also serves as a private venue for weddings, parties, and corporate events. Today, AJF has approximately 200 active and sustaining members. Members include working women, stay-at-home moms, business owners, and professionals who want to make a difference in our community -- one life at a time. Any woman may join AJF who has a strong interest in volunteerism and is at least 21 years of age. For more information on becoming a member, please visit our Membership page.